Human skin and wet human skin. If posting your own rendered images or video of this scene anywhere out of this thread, please credit Steven Stahlberg. Use any 3d software and techniques you would like. thanks to you and Steven for this Challenge! Do you think we could get a version with the meshes already separated instead of them being one big obj? Why is there a second bust next to the complete “assembled” model? Is there a special meaning to this? Could we maybe get the sculpted hair as curves? 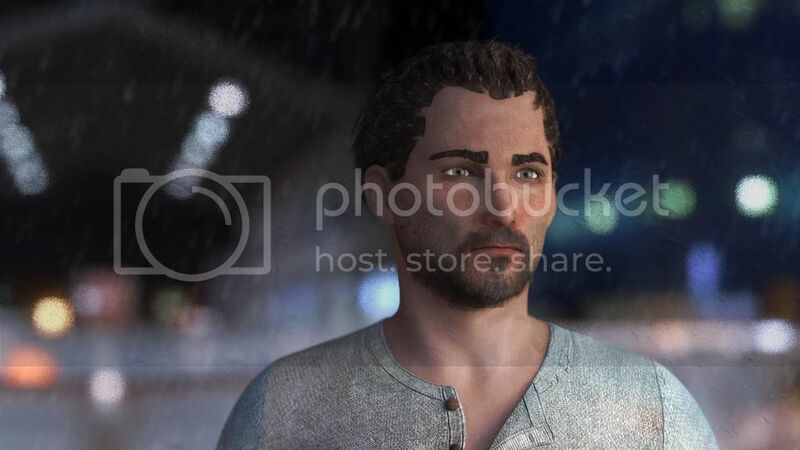 If you’re trying to do photo-real (wet) skin and then you don’t have the corresponding photo-real hair, I think it will be very difficult to make the image work. I just thought it might be that the hair exists as sculpted curves anyways, depending on how the model was created. If this is not so and there’s only the flat geo’s, I think it would be very nice to have the opacity maps that correspond to the normal maps that are in the archive. The model is like that, no change expected man. It’s already a nice free model shared, I think it’s a bit bold to ask retake. Of course the wet look would need wet hairs, but the model is like that do without it. Separating the meshing into different objects is a common operation in many packages that is usually a one click solution. As for the second bust next to the complete one, not really sure. Once you break/separate the main bust, the character model is the same. Maybe its there for reference. I think you will have to sculpt your own hair curves if you want something decent. There are no colour textures. 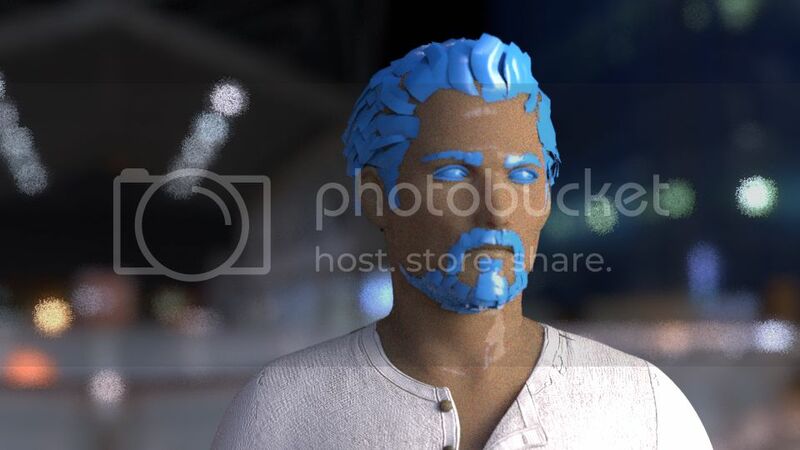 So the normal mapped hair can be cumbersome to paint at best. Here is my first WIP. Just getting the model in and seeing how it looks and imports and its great thanks so much for the model Stahlberg! Remember guys you make this your own. So what it doesn’t have hair curves make them yourself. This is about learning and this industry is never going to give you exactly what you want. Its about learning and adapting and making things your own. WIP 2. Adding some texture and getting a feel for comp. Simple light setup one main light and a HDRI for ambience. I think im going to give it a more spot light feel from surrounding cars. Going to add some ambience as well for the overall scene. This will be amazing! will get on it this week. Thank you Steven Stahlberg for the model and Jojo for setting the scene up. Blade runner has always been one of my fav movies and to emulate the style set up by Ridley Scott and Sid Mead will be a challenge but one that is very interesting. Iv’e never remotley rendered a character at all, so be nice. This is just a shader test before I move to the other bust. Are the Colour maps included? Thanks for the scene btw. When I try to import the OBJ into max14 or 15 = messed up mesh, completely twisted, unusable. Would someone be so kind to export an FBX or straight up max file for me? That would be nice, thanks. Chech retriangulate, That fixed it for me. Here is my work in progress so far. Hope you guys like it so far. It’s damn hard to make a nice confincing wet material. I was thinking to maybe render all the layers separate and do most of the work in comp. Maybe that will make it a bit easier. Its still very much expiremental. hi everyone, first wip… :wavey: first time to upload files. I cant seem to upload in the forums, my files are too big I think. so about the model, you are free to modify as you prefer. Since it’s a challenge probably it will be better fo you to paint your own map. Also keep in mind that the model was tested in marmoset and unreal engine, so it’s suitable to be used in realtime. why don’t you give a look here ? Doing a some minor facial expressions in zbrush then I will take the model to Unity. Luck6 and Pedronix… Nic work. Looking forward to the finished work. This is a lighting challenge?! Shader/Texturing/Lighting challenge. Since I had the change to have a model from Stahlberg I guess it was kind of fun to light a pro model. Feedback is always wellcome and also idea for new challenge/help for creating new scenes.